Nailbinding, a looped stitch made with a conventional needle, is used to create yarn goods such as coptic socks. These were made with a large indentation in between the front toes and worn with sandles. Knitting is believed to have developed from nailbinding and spread outwards from Egypt through trade and conquest. Stockings made from woven cut cloth (either linen or wool) were still the norm although coarsely knitted socks could have been worn by the lower classes. Hand knit stockings have become common in estate records throughout Europe. Silk and worsted (wool) are listed. Fashion greatly influenced the embelishments added, with men's stocking being generally more elaborate than those of the ladies. Stocking frame is invented by William Lee. He died in 1610, but his invention was carried on by his business partner George Brooke and his brother James Lee. 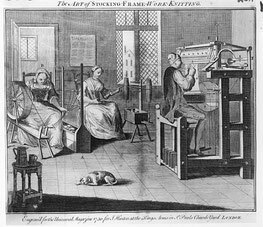 In the 1620s a finer gauge of knitting on the frame began to be possible through innovations in the knitting frame design. By 1641 there were two master hosiers in Nottingham and an unspecified number of frames. Despite a charter granted by Charles II in 1663, which specifically forbade the export of frames used for making silk stockngs, 400 frames were exported to France, Italy, and Spain between 1670 and 1695. 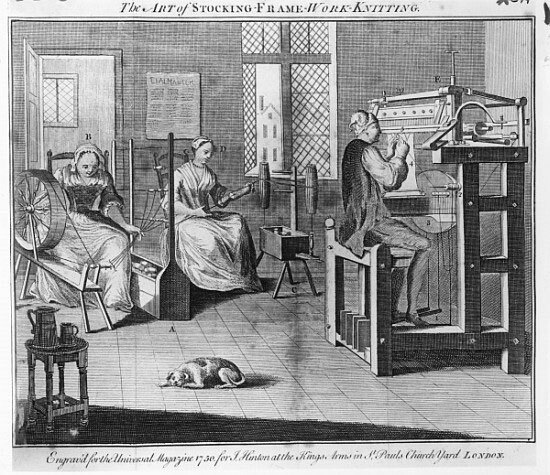 By 1695 there were 1500 frames in London alone, producing frame knit goods. Hand knitting is still very much established in the industry. In the late 1600s the tuck presser is invented, allowing the frame production of stockings with a ribbed texture. These do not become highly fashionable until later. The knitting frame continues to develop, become even finer and more efficient. Stockings with decorative gores, contrasting colors, and elaborate embroidery are available to the fashionable to compliment their outfits. During the 1730s there is a shift in fashion and white becomes the preferred color for stockings for both men and women wearing full or formal dress. In 1738 Lewis Paul patented a machine for spinning cotton. In America there were 150 stocking frames in Germantown and Philadelphia before 1755. Additional frames soon appeared in Hartford, Litchfield, and Wallingford, Connecticut and Poughkeepsie, New York. The cutting off of American trade routes during the War of Independence further stimulated the domestic industry. By 1765 the European stocking industry supplied hosiery to not only Europe, but also India, North America, and the West Indies. In 1775 a smooth cotton thread highly suitable for hosiery is produced. Cotton stockings soon become very fashionable. By 1778 factories in Norwich, Connecticut were producing silk and worsted as well as cotton and thread stockings. These factories made hosiery that was advertised in 1789 as cheaper and more lasting "than those of any nation of Europe".